The Bible’s gold-edged pages fan out on the kitchen counter, like an invitation to dine, to savor. And I do. I devour old words. This is the best meal I’ve had in a long time. It’s one of those days when a second-helping isn’t enough, when you know that a soul can emaciate without this. Sometimes, it’s feast or famine around here with the Scriptures. And I know it’s not right, but that’s the truth. I need a steady diet; I know that. I’ve had this particular meal of words before, but I hunch over top of these words, like I’ve never tasted them before. You know that feeling? Like it’s the first time you laid eyeballs on some passage, and — pow — it smacks you somewhere under your ribs, to rattle your soul. These words pierce me through, all over again, marinate on the inside, pour over me. What am I tasting here? What is this? Why is He called the Word? I consider reading the study notes or consulting the commentaries, but that would be like asking for the recipe before really taking a bite. I want to test my palate first, want to talk it over with the Cook. Want to savor every bite. Right now, I don’t need Google; I need God. I don’t need commentary; I need Christ. I light a candle, and in shimmering light, something flames up in me, too. The Word is living and active, and I want to plumb its depths. I grab a pencil and a scrap of paper. I doodle, swirling sloppy loops and letters and names. Every word I write is a Jesus word: Messiah, Creator, Alpha and Omega. I write the names of God. Word became man, with tear-ducts and fingertips and wisdom teeth and sinews and DNA and fingerprints and elbows that could skin, and tonsils that could swell. He became man with shoulders broad enough to carry a cross up a hill. Logos became a person, and I press lead to paper imagining the absurdity of a King wanting to exchange Heaven for this rancorous place. I shake my head, awed and grateful. I write more words: Yeshua. Savior. Sustainer. Perfect Sacrifice. Bread of Life. Is there no end to who He is? I scratch that name down, too. He’s coming more alive to me. See now, these ancient words? See them here? They are more than letters dropped on pages. These words are a Person. Just a small post from the archive. Battling illness here. What name of God means most to you today? Oh Jennifer. This is how I feel lately too. YES. Preach it sister. oh, me too! Me, too! Thanks Em … When I get stuck in study, I am so often tempted to quickly go Google for an answer or thumb through the commentaries. Which isn’t bad. But I sense that God wants me to just sit with it for a while. To just sit with HIM. Bridegroom–because He is a person. I am his bride and oh how, I want to be with him in the fullness that sits on the edge of my knowing–and being known. And won’t that wedding feast just knock our socks off, Dea? Abba, Pappa is the name that stand out above all the other names! Thise two names are filled with so much compassion and love! Thanks for being here, Mia… I love the Abba name … reminds me that I’m always my Heavenly Dad’s little girl. Dear Jennifer, seeing your words emerge on the page as a person just set my love for Jesus aflame all over again. It’s CRAZY and SCANDALOUS- the way He chases us. One of my favorite names right now is El Roi, the God who sees. In a world that is a constant blur, I’m so grateful for One who sees me, my children, my tiny life on this spinning globe. Love the way you love Him, friend! El Roi … Yes. One of my favorites too. At times when I’ve felt completely invisible, I know that God still sees me. “I AM” – That’s the Name that always, always gets me. So much in that. Love this: “Right now, I don’t need Google; I need God. Beautiful post today, Jennifer (as always). Yes…. The I Am. Yahweh, YHVH. Yahweh holds a very special place in my heart. Long story, but I have a Y scar on my leg, and it reminds me of God’s sovereignty over all things. Jennifer, sweet friend, this is beautiful, and so very much needed here today… thank you. Praying for you and your family. Love you. Thank you, Kris. We’re feeling better now. An unexpected late-season bout with cold and fever and aches and general Yuck. Love the graphic you made up there. And of course, get well right away! 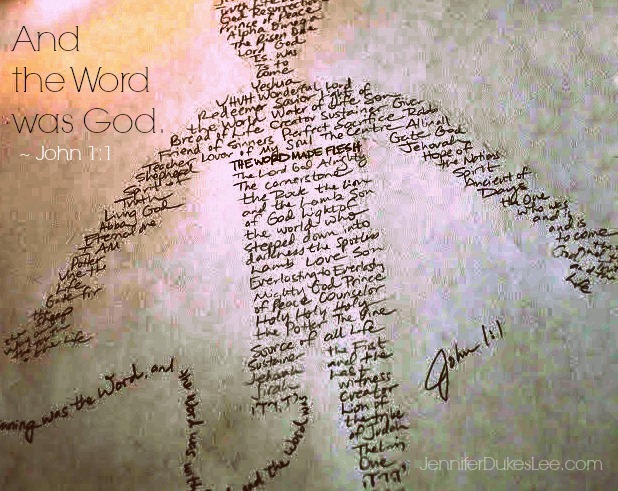 That is one beautiful way to capture Scripture visually… Wow! I’m with Emily……preach it! I have to have the word in my hand, to underline and cross reference and all. I love the way you made the ‘body’ out of words–so fun, Jennifer. My favorite word for God right now? El Roi–the God who Sees. I have had that nudging to draw closer to the Word Jennifer. I am the same way – feast or famine. I remember this one and it is just as powerful the second time around. love it! 🙂 indescribable God! Praying for you, in this season of reflection, Ro. Jennifer, this is a beautiful post. I love your photography, but the sketch of the names of the Lord is beyond description. It’s a powerful statement. I can’t wait to show “my” teen girls this Sunday. I pray you’re feeling better soon. Thanks for your ministry here. You are a blessing to many. Wow! Love this writing; the whole idea of His names, so powerful. It may have been a draw from the archives, but it was ordained for today. Get well, friend! I’m glad you reposted this one, I love it! I had never seen this post before. So glad I caught it today. Absolutely beautiful. “Redeemer”, for He has redeemed my life from the pit and set my feet upon solid rock. This is beautiful, Jennifer. Thank you for re-sharing this amazing post! Thank you Jennifer. I’ve never seen anything like this before…amazing! Psalm 148:13 says, “Let them praise the name of the LORD: for his name alone is excellent; his glory [is] above the earth and heaven.” I am currently reading a book about the names of God. One of my favorites is YAHWEH-ROHI meaning The Lord Our Shepherd – After David pondered his relationship as a shepherd to his sheep, he realized that was exactly the relationship God had with him, and so he declares, “Yahweh-Rohi is my Shepherd. I shall not want” (Psalm 23:1). I love that God is constantly with us, watching over us, guiding us, protecting us, providing for us and loving us. It is more difficult to pinpoint my favorite name for Christ. Since I am doing a Bible study on John right now, “LIGHT OF THE WORLD” comes to mind. John 8:12: When Jesus spoke again to the people, he said, “I am the light of the world. Whoever follows me will never walk in darkness, but will have the light of life.” I want to walk in His light and reflect His light to others…just like you are doing my dear friend. Get well soon! Ah, but you have chosen the better thing, my friend. Linking up and praying to the God who is everything! A few of those glorious names came to mind in my story for the day about trusting Him for more than I can ask for or imagine! Abba Father, I am His bride….His presence so real in times of broken hearted pain. Considering all the names that He is too me brings an overflow of grateful love that He could even care for me. Then He says…I Delight in you! Oh, my! Your word image strikes at my heart! Awesome! How do I choose one name? They are all so wonderful. I think, right now, the name would be Lord. It keeps me on my knees. Blessings to you and I’m praying you recover quickly!